Starting with cavemen who adorned their walls with primitive artwork and animal-skins, men have taken great pride in their homes and influenced their design and aesthetics, not settling merely for a space to provide protection from the elements. Throughout history, men have made home design choices purely for the purpose of pleasure and a reflection of their personal interests. Ancient Egyptians decorated their homes with murals and sculptures. The Greeks added impressive architectural features to their homes, demonstrating their status and civic pride. We could fill this entire magazine with the design contributions of Thomas Jefferson. Decorative elements made of materials from all over the world celebrate our global economy and our appreciation for other cultures, and today’s man draws upon influences from all of these to create an eclectic space that is truly his own. I’ve always been the kind of girl who gets along well with men. My father is a great guy who likes to build things. My father-in-law always tells the best story in the room. My brother collects coins and guns. My brothers-in-law and nephews are athletes, builders, hikers, hunters and huge sports fans. My husband is a waterfowler and a fisherman and has well-trained dogs…and canoes…and a pickup truck…and a bunch of other manly stuff.1 Even my son has a Lego collection that is the envy of the second grade. You get it: I have an appreciation for men and their manly pursuits. That’s why I wanted to showcase some of Central Virginia’s most interesting men and how they utilize their homes to support their hobbies. Take a look. I think you’ll like it. Chuck Bullock is a huge sports fan. 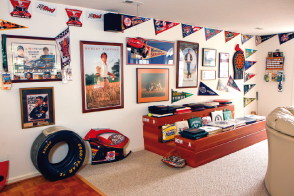 He has collected memorabilia from sporting events for over 20 years. With it, he created a sports bar to entertain friends. Of all sports, baseball is Chuck’s favorite. Of the 30 major league teams, Chuck has visited more than half the parks and has a goal of visiting the rest. He has been to a World Series, an All-Star Game, the Baseball Hall of Fame and even the Field of Dreams in Iowa. In his sports bar, there are bleachers inspired by those found inside the Milan Lounge in New Orleans where Chuck and his friend Karl used to watch Cubs games in the afternoons (back before Wrigley Field had lights!). There is a coffee table built around an autographed Ward Burton Caterpillar NASCAR hood, a Dale Earnhardt-signed NASCAR helmet, a vintage Las Vegas slot machine and a colorful Leroy Neiman print of George Foreman. In addition, there are reminders of golf tournaments, tennis matches, football games, professional prize fights, NASCAR races and horse races. But there is one sports memory that is impossible to display and can only be described: Mohammed Ali once kissed Chuck’s wife in the lobby of the Bellagio Hotel in Las Vegas. Lord Byron said, “Wine cheers the sad, revives the old, inspires the young and makes weariness forget its toil.” Since ancient Romans stored wine in catacombs under their city, wine collectors have known that wine ages best in relatively dark, damp and cool conditions. Wine is, after all, one of the few consumables that can improve with time, given the right set of conditions. Wine aging is both an art and a science. The ideal environment in a wine cellar is a constant and humid 55 degrees with no sudden fluctuations in humidity or temperature. Even the angle at which the bottle is stored can affect the wine’s maturation. Unopened bottles should be stored horizontally so the wine stays in contact with the cork, keeping moisture in and preventing the cork from drying and shrinking, which would allow too much air into the bottle. When wine meets air, it oxidizes and can become bitter. Tim Courville’s wine cellar has space for a wine-tasting table and display space for stemware and accessories such as aerators and corkscrews. It is housed in a space that is tucked under the veranda. He designed the cellar and built the shelving himself. Scott Elliott got his first dirt bike when he was 5 years old and remembers a happy childhood riding his motocross bike… and still rides today. Now, Scott has switched gears to focus on his children’s participation in motocross. Last year, Scott designed and built a custom garage for his family’s unique hobby. From the outside, you would never guess the structure wasn’t part of his home’s original design. It nestles in alongside his residence and appears to be a traditional garage, perhaps with a garage apartment above. Once inside, however, you are transported to a professional motocross workshop and trophy room. It has an open, barn-like look and is constructed of locally sourced poplar with details showcased in rivets and steel. 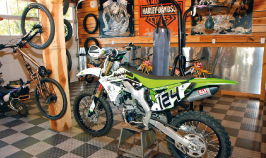 With ample room to hold 15 motocross bikes, their safety equipment and a wall full of trophies, you can easily see the importance and influence that motocross has for his family. On winter weekdays between Thanksgiving and Easter, Lyons Davidson often found himself feeling lonely while tuning and waxing skis by himself in the basement. He decided that if he were working in a more inviting place, his wife Sarah and their daughters might keep him company. So, Lyons turned an unused L-shaped bonus room into a sports equipment storage and rehab center, complete with a large flat-screen television. Not limiting themselves to wintry pursuits, the Davidsons are year-round athletes and have quite a collection of bikes: road bikes, triathlon racing bikes, mountain bikes and cyclocross bikes, to name a few. The addition of a 40-foot- long bike rack along one wall helps keep the bikes from getting in a tangle. In addition, the room features storage for helmets and training tools specific to their sports and a display space for the many medals and trophies they have accumulated during competition. Now that everything has an official home, Lyons can keep his tools and equipment organized and within easy reach, cutting down on time spent tending the equipment and allowing him more time to enjoy it. Tommy Green has been into motorcycles since he got his first Yamaha 125 motocross dirt bike as a kid. 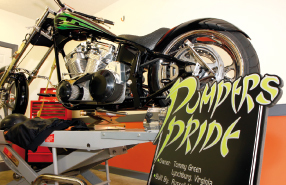 Fast-forward 30 years when Tommy had a custom dream bike named “Pumper’s Pride” built by Russell Marlowe of Carolina Custom Cycles. After touring Pumper’s Pride on the show circuit, Tommy retired his bike and now enjoys riding it on the Blue Ridge Parkway and down to Myrtle Beach’s famed Bike Week (and everywhere in between). Tommy’s interest in unique vehicles extends to the 4-wheeled variety as well. In addition to Pumper’s Pride and a really sweet Harley-Davidson Street Glide, Tommy also owns a 1937 Ford “rat rod” truck. A typical rat rod is a late-1920s to late-1950s coupe, roadster, sedan or truck. In contrast to the shining glimmer of a “hot rod,” rat rods purposely appear unfinished and their custom paint jobs are hand-applied in a matte finish in black or another drab color. Interiors are kept sparse, often with Mexican blankets and bomber seats outfitting the interior, along with Maltese crosses, skulls and other accessories added as adornments. People of a certain age in Lynchburg recall “The Vogue” as downtown Lynchburg’s most elegant clothing store. As the son of its owners, Max Feinman grew up among sartorial splendor and fondly remembers accompanying his parents on frequent buying trips to New York when he was young. 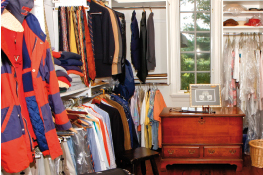 It’s no wonder, then, that he had a custom closet designed and built to share with his wife Bunny long before such spaces became commonplace. Featuring a floor-to-ceiling three-way mirror, Max’s closet is a large walk-in with double-hung rods, cubbies and an abundance of shelving. Illuminated by bright overhead lights and a large window, Max can easily see the difference between navy and black and choose the perfect pocket-square to complete his look. Max is a rather dapper man and likes to accessorize with wool ivy hats and colorful argyle socks. He has fun with his clothing and enjoys dressing well. Shelves hold his luggage and there is plenty of space for packing. Shoes are kept off the floor in cubbies and drawers are available for small accessories like cufflinks, studs and cummerbunds. On the far end of the room is a handsome custom-made Lane cedar chest given to him as a gift by a thoughtful patient, Mr. Landon Lane of Lane Furniture in Altavista. Alan Kauppi played on basketball teams for 20 years when he was young, but then life got busy and before he knew it, a decade had passed with hardly so much as a dribble. All that changed last year when he had the chance to coach his sons’ basketball teams and he remembered just how much he enjoyed shooting hoops. Alan knew he wanted a court where he and his children could enjoy basketball together. As home improvement projects often do, Alan’s basketball court soon morphed into a much-larger-scale outdoor project. Alan grinned as he recalled, “I told Ula that if I could pick out the basketball goal, she could pick out everything else.” Therefore, the Kauppis added a terraced and landscaped stairway leading from the basketball court down to a firepit and lounge which overlooks a nearby children’s play structure and ties everything into the new deck they had installed the previous year. Now Alan can shoot baskets while tending his grill and keep an eye on the kids on the playground at the same time. Slam dunk! Occupation: 3rd Generation Owner, Foster Fuels, Inc. Disaster Relief Business. Cattle Farmer. 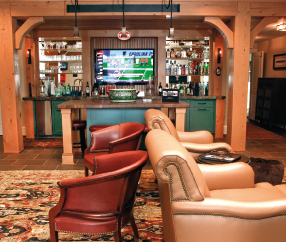 To describe Watt Foster’s television room in his spectacular home at Smith Mountain Lake as “masculine” is an understatement. With three flat-screen TVs and a fully-stocked bar easily accessed by a fantastic outdoor stone patio, Watt ensures that his guests are well-tended and that everybody can watch college football from any angle. Inside and out is an epic celebration of wood, where you can admire its grain and feel with your hand just how solidly this home was built. Even the details are manly. The double-thick, leather-finished, rocked-edge slabs of rainforest green granite on the countertops look a little bit like a Mossy Oak camo pattern. Big unpolished stones surrounding the fireplace and hearth were quarried from his family’s homeplace in Brookneal and painstakingly fitted. And there’s fire! With Watt owning a propane gas business, he knows fire and designed the fireplaces, gas torches, fire pits, a dining table with a fire feature in the middle of it—and grills and smokers on which to cook meat. The propane system, along with elaborate outdoor lighting, makes the place look like “Survivor Island” at night. It is one of the many features that makes the place truly amazing. However, please don’t call Watt’s home a “man cave.” The artwork, technology integration and décor are innovative, timeless and classic. Jay Meadows got into rock climbing when he was in medical school. The sport requires tremendous mental focus and physical fitness – a great two-birds-with-one-stone activity for someone who has very little recreation time. Climbing is a sport that can be enjoyed solo or with friends. 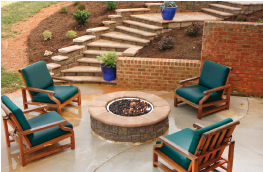 And, for those who work primarily indoors, it offers a way to get outside and enjoy nature. Climbing is great for kids. They learn safety, responsibility and respect, and have a great outlet for all that youthful energy. So, when they moved into their home, Jay eyed an unfinished storage space adjacent to their garage and decided it would be the perfect place to install an indoor rock climbing room for him and his children (and as his wife Kappa says, rarely herself). Over the years, Jay has had fun designing several different routes in the room. Some are meant for the short limbs of children; and others, like the one across the ceiling, are perhaps meant for Spiderman! The Meadows children and their friends naturally gravitate to this room during play dates. 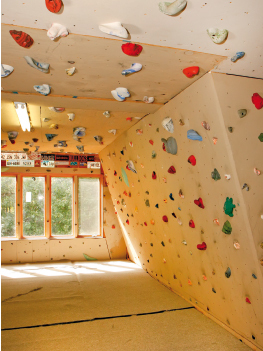 With thickly padded floors and all those colorful holds, Jay’s indoor rock climbing room is truly a space that is all about the joy found through physical fitness. Four years ago, while James LaPrade cheered for his wife Melody as she participated in the Angels Race, he became so inspired that he decided to take up running too. Since then, James has lost 50 pounds, completely transformed his body and recently completed his first Ironman 70.3 in Raleigh. To help him recover from his strenuous workouts, James installed a sauna in the corner of a spare bedroom that is also furnished with his racing bike on an indoor bike trainer, a wall-mounted flat-screen television and a mini-fridge stocked with bottled water. 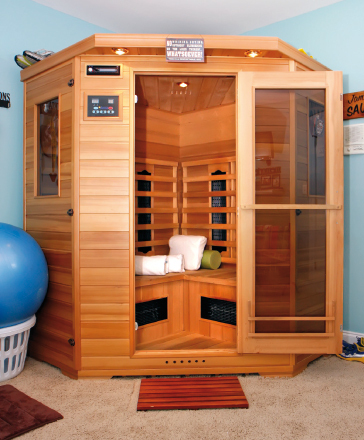 James says his energy-efficient sauna heats up quickly, and the ceramic heaters can easily be replaced as needed. While enjoying the benefits of dry heat therapy, James likes to stretch out and catch up on his Netflix queue because the interior of the sauna is also outfitted with speakers. A “Smart Home” is one where technology seamlessly blends into your home, enhancing your lifestyle and offering comfort, security, efficiency and convenience at all times, regardless of whether anyone is home. Appliances, lighting, climate controls, computers, entertainment audio and video systems, security and camera surveillance systems are all capable of communicating with one another and can be controlled remotely from any room (or any location in the world, for that matter) by phone or Internet. If it weren’t so cool, you’d wonder if it isn’t just a tad Orwellian. 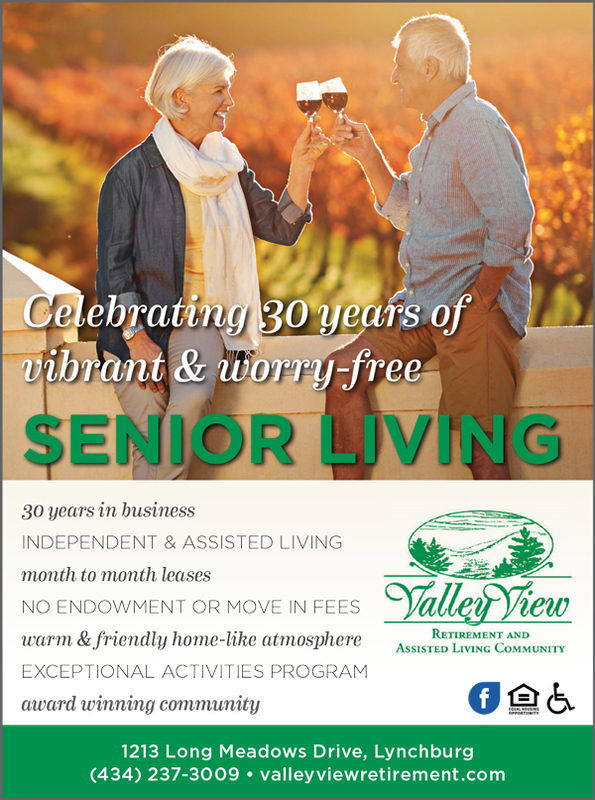 Frederick Wilt is a retired computer programmer who has an amazingly-automated home at Smith Mountain Lake. Because he has the expertise, he prefers to do his own installation and programming. “Frederick knows exactly what he wants and we get it for him,” said Jeremy Shelton of Integrated Technology Group. Jeremy adds, “He is so skilled, in fact, that he discovered glitches in several different components and alerted manufacturers of the defects.” With the swipe of a finger on a touch screen, Frederick can be miles away from home and adjust the thermostat and check the security of his home. For fun, Frederick is programming an elaborate model train set to run several trains at once without worry of a collision and he also enjoys building and flying radio-controlled model airplanes.